Martin Luther King Jr. slept there. But did he make history there? History Martin Luther King Jr. The row home at 753 Walnut St. in Camden, seen in 2017, continues to deteriorate. Civil rights leader Martin Luther King Jr. used the address to file a police complaint when a white tavern owner in Maple Shade refused to serve him and three companions in 1950. A review of claims that Martin Luther King Jr. lived in Camden when an ugly racial incident may have catalyzed his later civil rights activism has dragged on for two-and-a-half years with no bureaucratic decision by New Jersey officials. 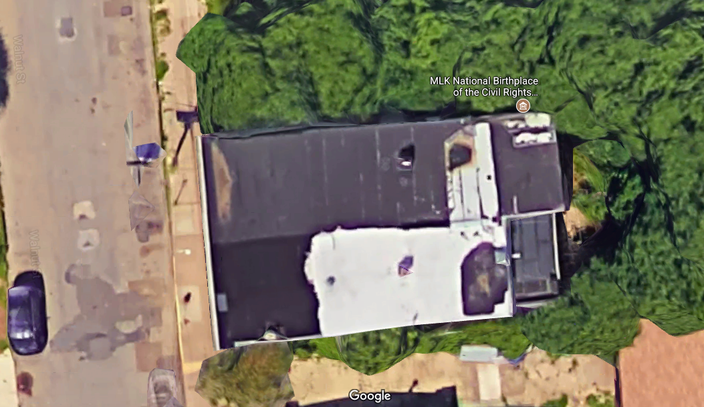 An aerial photo of the address on Google Maps appears to show a gaping hole in the roof of the property. Many windows are covered with boards, and several of them have shifted, leaving the interior open to the elements. Without a determination by the state on the building’s historic value, plans to repair the roof have stalled, leading to additional deterioration. 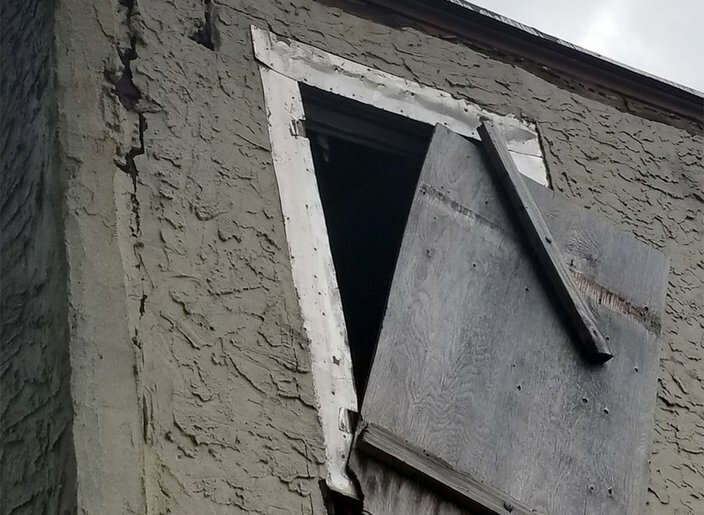 The home at 753 Walnut St. in Camden is labeled on Google Maps as the “birthplace of the civil rights movement.” The photo shows a gaping hole in the roof. Certification has dragged on for years as the building has deteriorated. • Did a refusal of service for King and three companions at a Maple Shade establishment – the owner fired a .45 caliber handgun into the air outside Mary’s Place – set him on a path toward civil rights activism when he lived in Camden? • And did the Camden property, where he appears to have lived with a fellow seminarian at Crozer Theological Seminary in Chester at the time of that incident, also play a significant role in his formation as a civil rights leader? There are some indisputable clues. The complaint, in which King alleged that Nichols went outside and fired a handgun after refusing service to the four, may be the civil rights leader's first documented attempt to confront and challenge racism. But the case was soon withdrawn when three witnesses declined to testify. Which may explain, at least in part, why King moved from courts to civil disobedience. There is no question the incident happened: a copy of the complaint, culled from King’s own documents, is included in Stanford University’s archives on King, who was assassinated on April 4, 1968, in Memphis. He added the state has not updated the city since the process began. “We’re in support, but as you can imagine, it’s a process. We don’t control the process,” added Basara. Similarly, the Coopers Ferry Partnership, which does development and redevelopment work on behalf of the city, “remains committed to the project,” according to a spokesman. A source, who asked not to be identified, said the roof of the Walnut Street home is so unstable that a plan to cover the roof with a tarp was abandoned by Coopers Ferry out of fear of injury. 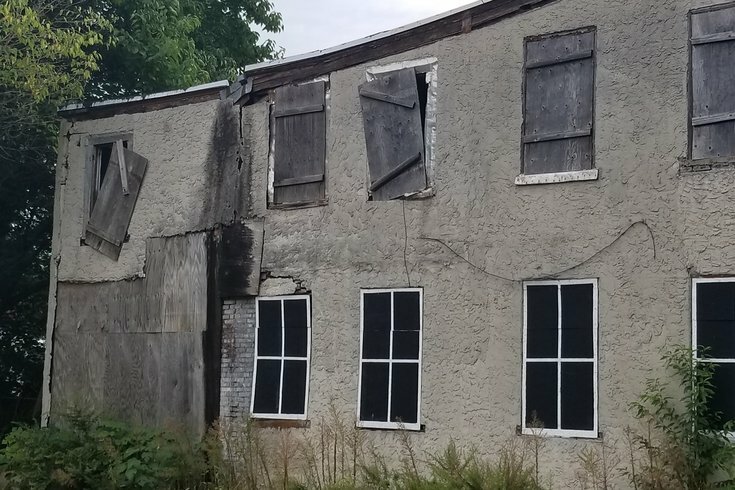 And a Coopers Ferry plan to secure about $230,000 in grant money to stabilize and upgrade the property has languished because of the state’s indecision. Likewise, a contract to transfer ownership of the long-vacant home from owner Jeanette Lily Hunt remains unsigned until the historic designation is confirmed – or denied. Hunt's father-in-law was the original owner of the home and he rented a room there to King and his best friend, another seminarian. U.S. Rep. Donald Norcross, who visited the home last year with civil rights icon John Lewis, a fellow member of Congress, remains supportive of the stalled project, according to his office. A preliminary application for historic designation was filed with New Jersey in March 2015. The applicant, Patrick Duff, acting on behalf of the building’s owner, Hunt, said he was told a decision could happen in as little as three months – the time frame is referenced in several of his correspondences with the state. But a more recent letter from a DEP official warned Duff the process could take far longer. As of now, a determination still awaits. A spokesman for the state Department of Environmental Protection said this week the review is “anticipated” in November, emphasizing there is no firm date. In an effort to assess whether King's presence at the home is significant enough to warrant historic status, the DEP's State Historic Preservation Office hired researchers from Stockton University to investigate the evidence. DEP spokeswoman Caryn Shinske said Wednesday that the state received a “preliminary” report from Stockton investigators on Aug. 21. She declined to release the report to PhillyVoice, citing policy on preliminary reports. “DEP understands the strong interest in this application and is working hard to ensure the research is as thorough and as complete as possible. We look forward to reviewing the final report, which is expected to include background and archival research, as well as oral history interviews,” added Shinske. A wooden board covering a second-story window of the rowhome at 753 Walnut St. in Camden has shifted, exposing the interior to the elements. One of the academic investigators, Stockton’s John O’Hara, had told PhillyVoice that he and collaborator Michelle Craig McDonald had filed what they considered a final report to the state on July 31. But a spokeswoman for the university said Thursday that the professor had the date wrong and added it was a draft, not final report. "The Stockton Research team submitted a draft of their report to the state on August 21, 2017, with the expectation that the Historic Preservation Office would review and offer suggestions to incorporate in the final report," the spokeswoman said. "That work is still ongoing." O’Hara's contract does not allow him to disclose his findings to anyone except the DEP, he had said. O’Hara had previously said a response from the DEP calling for more “talking with neighbors” did not happen until the start of Stockton’s fall school year, meaning the investigators have less time to devote to additional interviews. He said he has personally set an “unofficial” deadline of Oct. 31 for completing the expanded report and delivering it to the DEP. Meanwhile, with the winter season approaching, the property continues to languish. Full disclosure: U.S. Rep. Donald Norcross, D-1st, is the uncle of PhillyVoice Founder and CEO Lexie Norcross.